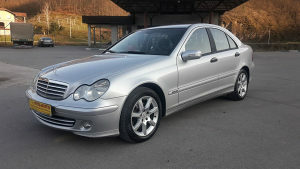 MERCEDES W 203 C 220 CDI, 110 KW/150 KS, 2005 G.P ! VOZILO JE U PERFEKTNOM STANJU, MAKSIMALNO UTEGNUTO I OČUVANO, POSJEDUJE KOMANDE NA VOLANU, KLIMU, TEMPOMAT, MAGLENKE, ALU FELUGE, NASLON ZA RUKU...ITD. VOZILO JE TEK UVEZENO I PLAĆENE SU SVE OBAVEZE DO REGISTRACIJE !